Bank of Japan: Heading for the exit? The US economy is going from strength to strength. It looks set to expand by 3% this year given that tax cuts will further fuel domestic demand and the softness of the dollar puts US exporters in a highly competitive position to benefit from the global upturn. Inflation is also likely to rebound as distortions relating to cell phone data plans drop out of the annual comparison while robust economic activity, rising commodity prices and a gradual pick-up in wage growth add to price pressures –we could see 3% headline inflation this summer. Having said that, we are currently forecasting no rate hike in 1Q18. Near-term activity data may be somewhat soft given bad weather in January and core inflation is likely to remain below 2% through to April. As such, incoming Federal Reserve Chair Jay Powell may choose to wait until the outlook is clearer before triggering consecutive hikes in Q2, Q3 and Q4. Nonetheless, with the Fed citing financial stability risks and loose financial conditions as additional reasons to raise interest rates, our forecast could be revised to insert a fourth hike, most probably for the March FOMC meeting. ECB watchers this year might feel as though they've stepped onto the set of a movie combining the scripts of “Groundhog Day” and “Aladdin”. Every time the ECB thinks it has bought some time, either macro developments or statements by ECB members undermine its plans and let the genie of policy changes out of the bottle. While the ECB had actually tried to hush any exit speculation with the October decision of “lower for longer”, strong macro data, a general fear in financial markets that inflation could return faster than anticipated and remarks by ECB officials have recently fuelled new speculation about the future of QE. We don’t expect any changes at January's ECB meeting but bank president Mario Draghi will have to address the latest speculation that QE could stop in September. We will be watching closely to see whether Draghi confirms what he said in October, that “it's never been our view that things should stop suddenly”. We would expect him to do so, as this would be the only way – at least temporarily - to get the genie back in the bottle. We stick to our previous view that the ECB will not stop QE in September but will rather decide on another “lower for longer” strategy beyond September, probably until the end of the year. 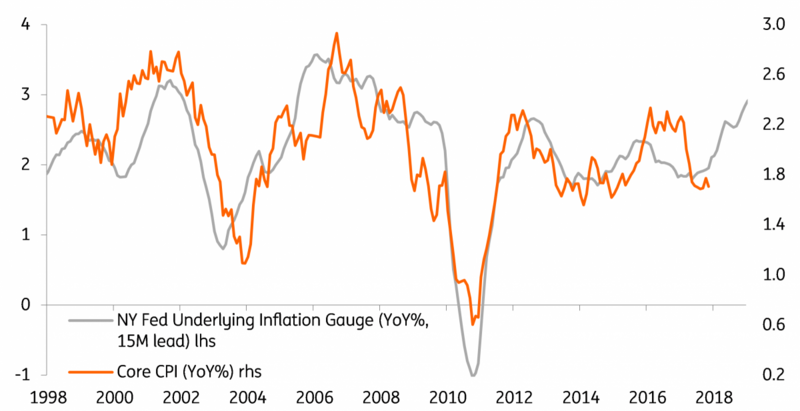 Interestingly, the ECB is increasingly focusing on growth and seems to regard inflation only as a derivative of growth developments. For the Bank of England, there are really two things that will matter most this year. The first is Brexit; the likely agreement-in-principle of a transition period by the end of the first quarter would be positive, averting the tail-risk of a "cliff edge". That still leaves a number of open questions, including whether a two-year transition is long enough, and whether firms will boost investment without having firmer details of the UK's future trading relationship. The second is wage growth; policymakers are looking for a sharp pick-up over coming months. There are signs of skill shortages in certain sectors, prompting employers to raise pay in a bid to retain staff. That said, the economy is still struggling and input prices are still rising, meaning some firms may continue to take a more conservative approach to wage setting. A rate hike still isn’t guaranteed this year - although this is a close call. Whatever policymakers decide, we think they have a fairly narrow window before the summer to squeeze in another rate rise, with Brexit noise likely to ramp up in the autumn. Recent BoE speakers haven’t guided markets towards a February rate rise, which leaves May's meeting as the most realistic hiking opportunity. There is increased speculation that BoJ governor Haruhiko Kuroda and his Monetary Policy Committee will start hinting at a possible exit strategy from their Qualitative and Quantitative Easing (QQE) Policy, which combines asset purchases with a zero percent target on 10Y Japanese Government Bonds (JGBS) and negative rates (-0.1%) on excess reserves on bank deposits held with the Bank of Japan. Although there is such merit in this speculation, given the duration and extent of improvements in economic growth, and recent inflation data has been more positive, much of the inflation pick-up is related to energy prices, and as such, almost certainly only a temporary response to crude oil fluctuations. So we don’t think the time is yet right for the BoJ to signal an end to the easing. If we are wrong and they decide to do so, we believe the most sensible course of action would be to simply formalise the undershoot of current asset purchases in a new target. This would send a moderate signal of policy re-alignment, whilst actually changing nothing on the ground. It could therefore be viewed as a dovish normalisation. The other factor to bear in mind is the approach of the April 2019 consumption tax hike. With data running as well as it has, this tax hike has to remain on the cards. If the BoJ waits too long to start moving on its exit plan, it may find its attempt to extricate itself from unnecessary easing clashing with the fluctuations caused by the tax hike. In short, the arguments for some normalising BoJ action are growing, but the story is not there yet. That said, the window for moving will not be wide open forever, and a move later this year, perhaps at the start of the next fiscal year, might be a sensible base forecast. The latest Riksbank minutes paint a fairly optimistic picture of the economic outlook in Sweden. Growth remains solid, inflation has returned to target, and the global upswing underway should provide a tailwind for the Swedish economy in 2018. The only cloud on the horizon is the sharp fall in the housing market this autumn, and even that cloud has a silver lining in the Riksbank’s view. That means it is natural for the Riksbank to start moving towards a tighter policy stance. The decision in December to end the QE programme was the first step in that direction, although the reinvestment policy adopted means the Riksbank’s balance sheet will continue to expand in 2018. Whilst the committee is becoming more divided, the Riksbank will now most likely wait to make its next move until there is more clarity on the ECB’s intentions. That is only likely to come in June. If, as we expect, the ECB extends QE beyond the current end date in September and signals a rate hike only in mid-2019, we think it will be difficult for the Riksbank to stick to its current interest rate forecast. A first full hike is expected in Q4 with a smaller probability for the first hike in Q3. At most, it could dip a toe in the water by increasing the policy rate by 10bps to -0.40%. Should the ECB turn more hawkish by the summer, that may very well open doors for the Riksbank to start hiking sooner as well. In December, Norway's central bank delivered an upbeat assessment of the economy, revising up forecasts for GDP and inflation, and shifting forward the expected date for its first rate hike by two quarters into December 2018. Since then, the data has been largely as the Bank expected: inflation rose to 1.6%, and activity indicators have been consistent with 0.6% Q4 growth. House prices did continue to fall in December, but at a moderate pace that will not overly worry the central bank. Rising oil prices suggest more hawkishness may on the way. 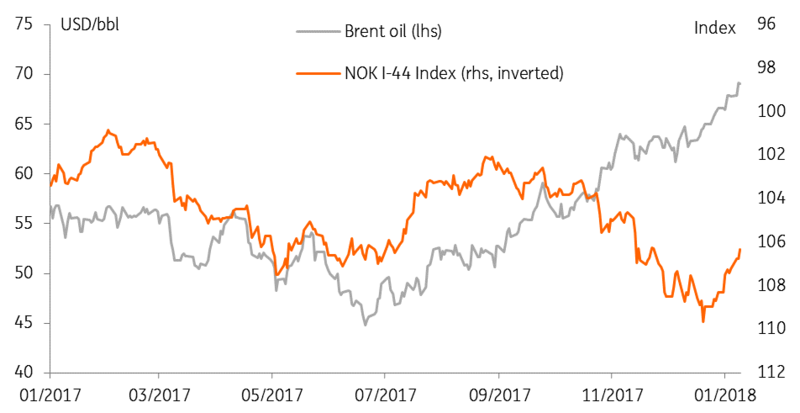 The Norges Bank will probably be pleased that the positive correlation between the Norwegian krone (NOK) and oil prices have returned in 2018. Since December's meeting, Brent is up another 9% and the Norwegian Petroleum Directorate published a fairly upbeat forecast for hydrocarbon production and exploration in 2018 and beyond (a key driver for Norwegian growth). That means there is a chance of further upward revisions to the Norges Bank's forecast, though that is most likely a story for March or June, should the oil price hold up. After some fairly disappointing data on consumer spending and wages at the end of 2017, the most recent Australian data has shown a marked improvement. What has looked like a faltering household sector came blistering back, with fantastic retail sales growth for November (published January 2018) and strong autos growth, too. Consumer confidence has also shifted higher, and the labour market data firmed more than had been expected. Yields on shorter-dated Australian government debt have picked up, though this could simply reflect moves in the US 2Y Treasury rather than hint at any imminent RBA tightening. Indeed, recent RBA commentary has made a big deal of unwarranted AUD strength, and with the AUD/USD pushing back up through 0.80, we believe the RBA will be happy to leave the cash rate on hold at 1.5% at their 6 Feb meeting. Even the Australian housing market has shown some signs of calming down, in a measured fashion, which will provide some solace to those who believe the RBA has left rates too low, for too long, and has contributed to a debt-fuelled housing bubble (not our view incidentally). Our house view is for only one rate hike in 2018 in the second quarter. Though recent AUD strength and RBA comments suggest we ought to push this back at least to 3Q18. Following a raft of strong activity data and a pick-up in inflation, the Bank of Canada raised the target for its overnight rate to 1.25% at its January meeting. Two bumper jobs reports and stronger inflation readings led policymakers to conclude that the economy is "operating roughly at capacity". And there are few reasons to see that coming to an end. We see further upside to growth given the better global backdrop and higher commodity demand. NAFTA remains the big unknown. US-Canadian trade flows equate to 32% of Canadian GDP so any disruption would be very bad news should President Trump decide to pull the plug on the agreement. With the next round of talks taking place shortly before the President's State of the Union address on 30th January, the risk is coming more sharply into focus and the Bank of Canada has said that the associated uncertainty is "clouding the economic outlook". That said, we are encouraged by Trump’s recent comments, hinting at a growing willingness to work with Mexico and Canada on a NAFTA compromise. As such, we are predicting two more 25bp hikes in the second half of 2018. If anything, the strength of the currency plays an even more important role in the decisions of the RBNZ than the RBA, and recent strength in the NZD means that any imminent rate hike views are really very far-fetched even if the ultimate direction later this year is upward. Recent data shows the New Zealand manufacturing sector at its weakest in five years and service sector PMIs have also eased back. We have a rate hike forecast for 2Q18, but this is beginning to look difficult to sustain, and we are likely to push this back and probably remove the second hike pencilled in for 4Q18.